TP-Link’s TL-WR710N travel router is very similar to Netgear’s PR2000 Trek, but in a slightly smaller form factor. 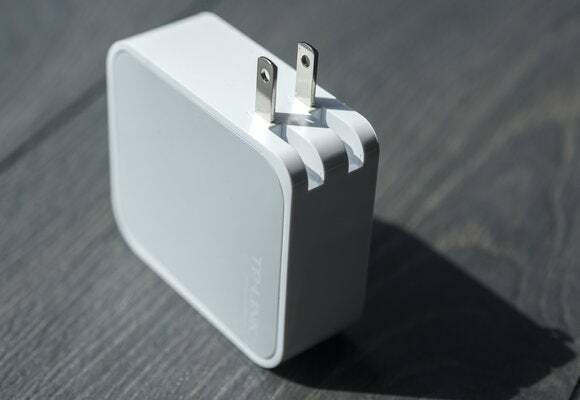 Like the Trek, it can plug straight into an electrical socket, it has a USB 2.0 Type A port for sharing storage, and it has two ethernet ports. Unlike the Trek, it supports only one 150Mbps spatial stream in 802.11n mode (on the 2.4GHz frequency band); and since it doesn’t have a micro USB port, it must be plugged into a wall socket (unless you travel with an extension cord, I suppose). If I had to choose between this and Netgear's Trek, I’d go with the Trek. 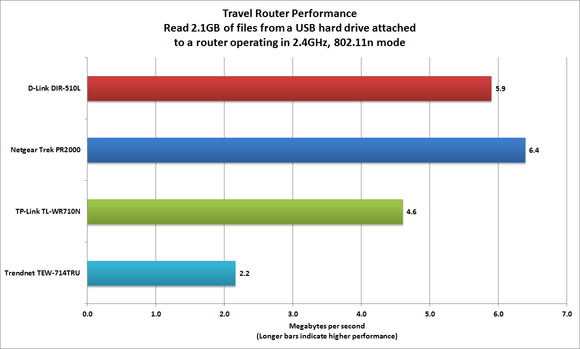 The travel routers from D-Link and Netgear deliver much higher performance than the TP-Link TL-WR710N. Then again, they're also more expensive. The TL-WR710N comes with preconfigured security, with its default SSID, wireless password, and admin login and password printed on the side of the device (albeit in itty-bitty print). Like TP-Link’s TL-MR3040, the Pocket Router supports up to WPA/WPA2 security with a RADIUS server. A single unlabeled LED (on the side facing out when the router is plugged into a wall socket report) glows blue when the device is working properly and blinks when the device is booting or when an ethernet cable or USB device is connecting to the router. Not terribly informative. This router doesn’t have a WPS button, either, but it does support the feature in software. The TP-Link TL-WR710N kicks sand in the fact of Trendnet's TEW-714TRU on this benchmark. 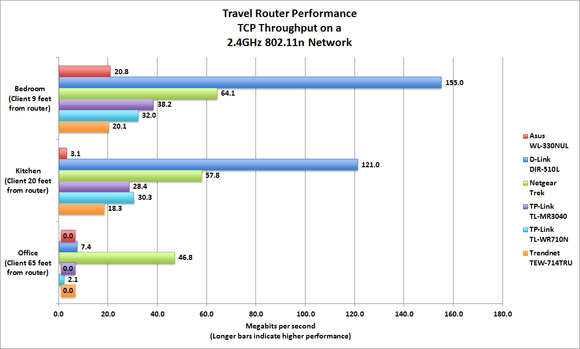 When I measured TCP throughput, the Pocket Router basically tied for third place with TP-Link’s diminutive TL-MR3040 travel router, but it delivered very slightly better range. When the wireless client was in the same room as the router, separated by nine feet, I saw TCP throughput of 32Mbps. When I moved the client to the kitchen, 20 feet away, the Pocket Router’s throughput dropped only slightly, to 30.3 Mbps. In my home office, where TP-Link’s other router couldn’t reach, the Pocket Router managed to squeeze out throughput of 2.1 Mbps. That’s adequate for surfing the web—as long as you don’t try to watch videos or listen to music. And you definitely wouldn’t want to transfer a lot of files over that distance. Still, three of the other routers I tested couldn’t service the client in that room at all. At $40 on Amazon, the TP-Link TL-MR3040 and the Netgear Trek PR2000 are street-priced about the same. The TP-Link’s user interface exposes more functions than the Netgear’s does, but the Netgear delivers much higher performance both in terms of TCP throughput and file transfers. If I didn’t have to take budget into consideration, on the other hand, I’d buy D-Link’s DIR-510L.